Recent developments in employment practices have increased the prevalence of non-standard work schedules—non-daytime shifts in which most hours do not fall between 8 a.m. and 4 p.m., when shifts rotate, or when schedules vary weekly or otherwise. For example, computer software now enables retail, restaurant, service, and other firms to predict hourly customer demand and delivery schedules with precision, encouraging employers to create “just-in-time” schedules in which workers are called in or sent home on short notice.1 By preventing many parents from adequately caring for their children, such practices adversely affect child and adolescent development. Non-standard schedules are more common among black workers and less-educated workers, and also among mothers who are low-income, younger, and have spent more years as single parents. Young children and adolescents of parents working unpredictable schedules or outside standard daytime working hours are more likely to have inferior cognitive and behavioral outcomes. Toddlers whose mothers work non-standard hours demonstrate worse sensory perception, memory, learning, problem solving, verbal communication, and expressive language. Preschoolers whose mothers work non-standard hours exhibit more negative behavior (depression, anxiety, withdrawal, aggression). Parents’ variable schedules require irregular family mealtimes and child bedtimes that interfere with children’s healthy development. For young children, mothers with non-standard schedules must make inconsistent and poorer quality child care arrangements. Parents with non-standard schedules can engage in fewer pre-academic activities with children, such as reading books, telling stories, and practicing reading, writing, or math skills. Parents with non-standard hours are more tired, anxious, irritable, and stressed, making children’s delinquency, aggression, and other negative behaviors more likely. Policy changes should create disincentives to schedule work in ways that impede employees’ ability to care for their children. For instance, legislation should require premiums for work performed beyond eight hours after the first working hour of the day or outside typical daytime hours, and provide predictable scheduling and pay, adequate rest between shifts, and access to adequate hours. 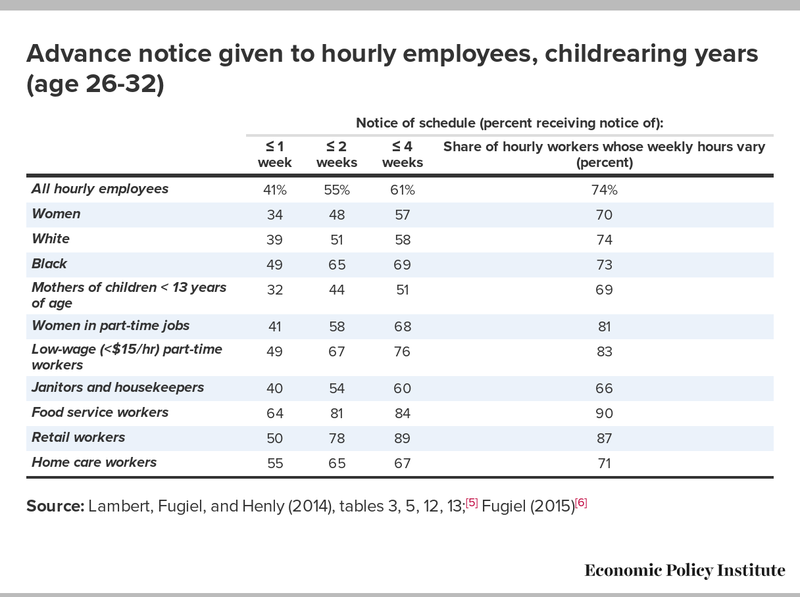 Table 2 shows shares of hourly workers, particularly working parents, who receive little advance notice of weekly hours, making their earnings unpredictable. Of hourly workers, about half of blacks, half of those with low wages, and one-third of mothers with pre-teen children get one week or less notice of their weekly schedules. Most don’t receive the same number of weekly hours; fluctuation is substantial. Sixty-nine percent of hourly paid working mothers of pre-teens report weekly fluctuations in hours. These differences in work schedules have consequences for children. Toddlers whose mothers work non-standard hours, taking account of other potential factors, demonstrate worse sensory perception, memory, learning, problem solving, verbal communication, and expressive language.7 Preschoolers whose mothers work non-standard schedules lose from 10 to 12 percentile points from the average in a normal distribution of negative behavior (depression, anxiety, withdrawal, aggression).8 Patterns established this early in life are difficult to reverse, and have a strong influence on adolescent and adult outcomes. “Just-in-time” assignments increase employee absenteeism and turnover.19 If reforms reduced these, costs to employers of greater regulation might decrease. Productivity could improve if employers invested in training now made cost-effective by higher compensation. Although differences—by race and social class—in parents’ non-standard schedules may seem small, they are compounded by other differences in social and economic conditions that predict worse outcomes for disadvantaged children and adolescents. Narrowing gaps in cognitive and behavioral outcomes requires coordinating labor market reforms with improvements in many other social and economic conditions that disadvantage youths. — The authors gratefully acknowledge support from the Nellie Mae Educational Foundation. Leila Morsy (l.morsy@unsw.edu.au) is a lecturer in education at the School of Education, University of New South Wales. Richard Rothstein (rrothstein@epi.org) is a research associate of the Economic Policy Institute. 1. Julia R. Henly and Susan J. Lambert, Schedule Flexibility and Unpredictability in Retail: Implications for Employee Work-Life Outcomes, Working Paper, University of Chicago Work Scheduling Study, July 2010, at pp. 5-6. Jodi Kantor, “Working Anything but 9 to 5: Scheduling Technology Leaves Low-Income Parents With Hours of Chaos,” New York Times, August 13, 2014. Susan J. Lambert, “Passing the Buck: Labor Flexibility Practices That Transfer Risk Onto Hourly Workers,” Human Relations 61, no. 9 (2008): 1203-27, at p. 1224. 2. Harriet B. Presser and Brian W. Ward, “Nonstandard Work Schedules Over the Life Course: A First Look,” Monthly Labor Review 134, no. 7 (July 2011): 3-16, at p. 6 and chart 3. 3. Presser and Ward 2011. See note 2. 4. Wen-Jui Han and Daniel P. Miller, “Parental Work Schedules and Adolescent Depression,” Health Sociology Review 18, no. 1 (2009): 36-49, at p. 7. 5. Susan J. Lambert, Peter J. Fugiel, and Julia R. Henly, “Precarious Work Schedules Among Early-Career Employees in the U.S.: A National Snapshot,” Research Brief, University of Chicago, Employment Instability, Family Well-Being, and Social Policy Network, August 27, 2014. 6. Peter Fugiel, email correspondence with author (Rothstein), January 4, 2015. 7. Wen-Jui Han, “Maternal Nonstandard Work Schedules and Child Cognitive Outcomes,” Child Development 76, no. 1 (2005): 137-154. Erika C. Odom, Lynne Vernon-Feagans, and Ann C. Crouter, “Nonstandard Maternal Work Schedules: Implications for African American Children’s Early Language Outcomes,” Early Childhood Research Quarterly 28, no. 2 (2013): 379-87. 8. Pamela Joshi and Karen Bogen, “Nonstandard Schedules and Young Children’s Behavioral Outcomes Among Working Low‐Income Families,” Journal of Marriage and Family 69, no. 1 (2007): 139-56. 9. Wen-Jui Han, Daniel P. Miller, and Jane Waldfogel, “Parental Work Schedules and Adolescent Risky Behaviors,” Developmental Psychology 46, no. 5 (2010): 1245-67. Han and Miller 2009. See note 4. 10. Lambert, Fugiel, and Henly 2014. See note 5, at p. 6. 11. Wen-Jui Han, “Maternal Nonstandard Work Schedules and Child Cognitive Outcomes,” Child Development 76, no. 1 (2005): 137-154, at p. 150. 12. Lambert, Fugiel, and Henly 2014. See note 5, at p. 2. Kantor 2014. See note 1. 13. Anna Gassman-Pines, “Low-Income Mothers’ Nighttime and Weekend Work: Daily Associations With Child Behavior, Mother-Child Interactions, and Mood,” Family Relations 60, no. 1 (2011): 15-29, at p. 23. 14. Han and Miller 2009. See note 4. Han, Miller, and Waldfogel 2010. See note 9. Joseph G. Grzywacz, Stepanie S. Daniel, Jenna Tucker, Jill Walls, and Esther Leerkes, “Nonstandard Work Schedules and Developmentally Generative Parenting Practices: An Application of Propensity Score Techniques,” Family Relations 60, no. 1 (2011): 45-59. 15. Gassman-Pines 2011. See note 13, at p. 23. Joshi and Bogen 2007. See note 8, at p. 150. Lambert, Fugiel, and Henly 2014. See note 5, at p. 6. Henly and Lambert 2010. See note 1, at pp. 24-25. Julia R. Henly and Susan J. Lambert, “Unpredictable Work Timing in Retail Jobs: Implications for Employee Work-life Outcomes,” Industrial and Labor Relations Review 67, no. 3 (2014): 986-1016, at p. 986. 16. Lambert, Fugiel, and Henly 2014. See note 5, at p. 2. 17. Rebecca Shabad, “Democrats Unveil Measure to Address Unfair Scheduling Practices,” The Hill, July 15, 2015. Jana Kasperkevic, “Elizabeth Warren to Help Propose Senate Bill to Tackle Part-Time Schedules,” Guardian, July 23, 2014. Richard V. Reeves and Edward Rodrigue, “Do Unpredictable Hours Undermine Upward Mobility?” Brookings Social Mobility Memos, December 11, 2014. 18. New scheduling legislation has been introduced in 2015 in California, Connecticut, Illinois, Indiana, Maryland, Massachusetts, Michigan, New Jersey, New York, and Oregon. A growing number of municipalities are expected to introduce legislation in the coming months, including Albuquerque, New Mexico; Minneapolis, Minnesota; and Washington, D.C.
Information provided by Carrie Gleason, director of the Fair Workweek Initiative at the Center for Popular Democracy, June 19, 2015. See Fair Workweek Initiative, “Legislative Update,” May 21, 2015; and CLASP, “A National Repository of Resources on Job Scheduling Policy,” May 4, 2015. 19. Henly and Lambert 2010. See note 1, at p. 6.